Look at my mantle. Any one who knows me, knows I am not one who follows tradition, and yet my mantle is covered in family photos. I call it granny chic. My mantle has been covered in books, candles, driftwood and seashells, all things I love dearly but not things that make me smile as much as seeing beautiful photos of my family right when I walk in the door. And though “tradition” is the last word anyone thinks of when they walk into my home, it’s everywhere. It’s the bones of my wild design. It’s in the way I place my furniture, its in my dining room with its huge table and matching lime green chairs lined up on each side, its hiding in all the symmetry which I thrive on. Bottom line, It’s there. Tradition is my submissive boyfriend, it just lies there making everything look good while I plaster it in color and pattern. Color and pattern work best with tradition as their base. Now it might sound as if I’m a little ambivalent about tradition, and I am. Great design thrives on it, but don’t you ever dare call me traditional. Lets just all agree I follow some of the rules, only to turn around and break a few. I’m a rebel. 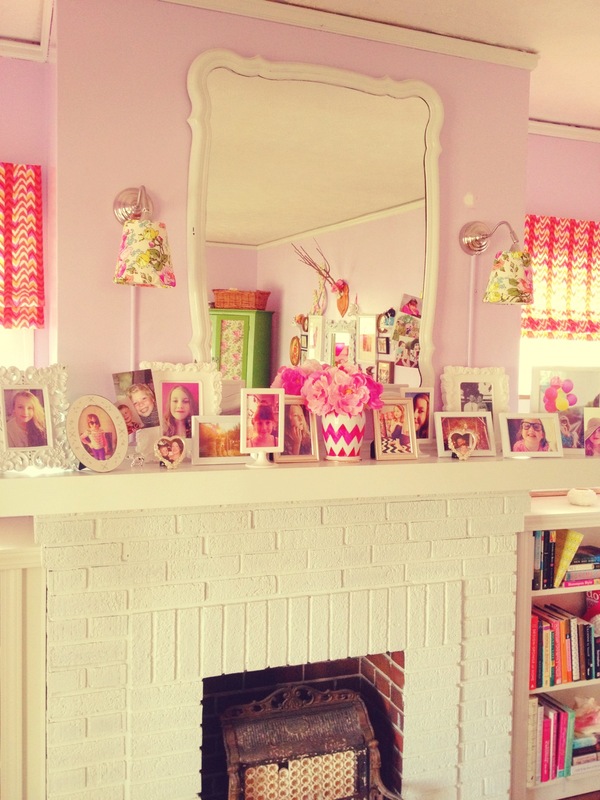 Now let’s talk some more about this fireplace redo. This Waverly fabric that I used for the roman shades is delicious. Its vibrant, looks great with light coming through it, and feels soft and creamy to the touch. It’s a heavier weight home dec fabric, that comes in at about 20$ a yard. All of the roman shades in my home, are DIY using this wonderful tutorial from Jenny of the Little Green Notebook. That lady is a real genius. 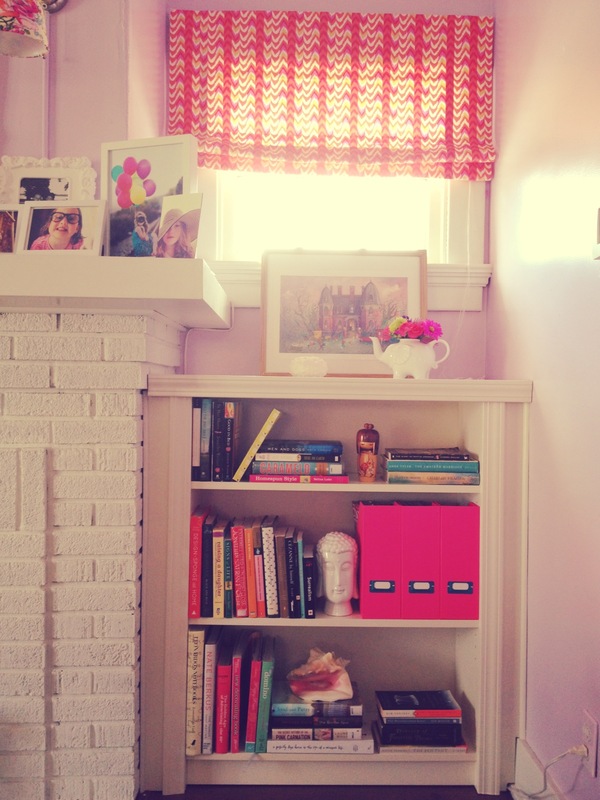 It also looks great against the Lily lavender Benjamin Moore paint color. I used my go to Ikea sconces, because lets face it, their cheap, and I’m always on a budget. I much rather spend my money on great fabric, which is why I chose to cover the sconce shades in this Amy Butler organic cotton floral. I love it so much that my entire living room is littered with it. 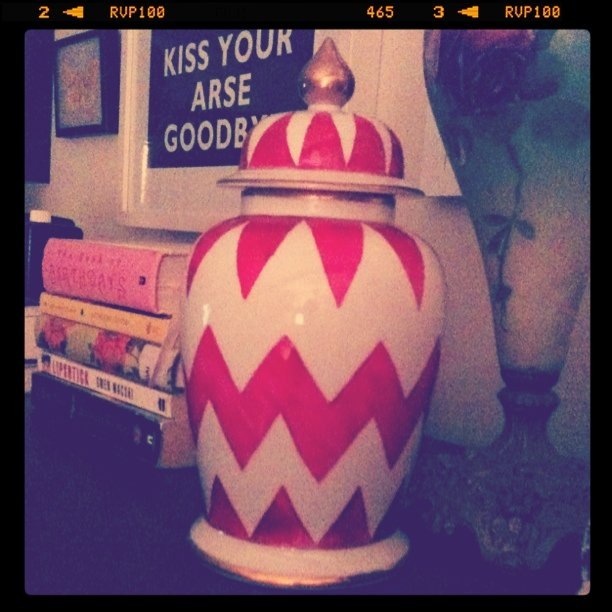 My husband made the chevron vase for me (its actually a ginger jar) well, OK, I forced him to make it. I thrifted the jar for 2$, and after seeing this one which was not in my price range, I decided a DIY was in order. So he taped the whole thing off, and hand painted it with ceramic paint. I adore it.